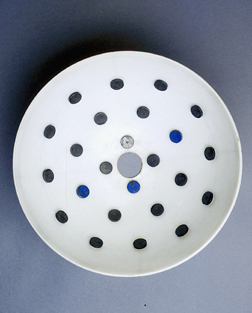 Image C. Gregory S. Chirikjian, one of the inventors of this spherical motor, is an associate professor in the Department of Mechanical Engineering at Johns Hopkins. 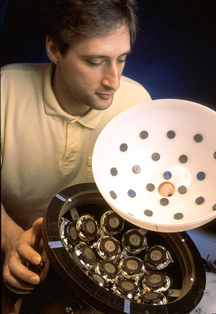 Image D. David Stein, a doctoral student in the Department of Mechanical Engineering at Johns Hopkins, is one of the inventors of this spherical motor. 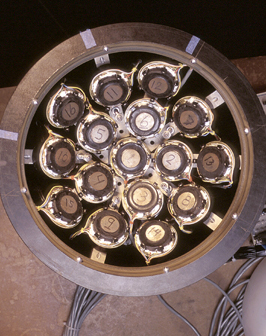 Image E. This close-up shows the permanent magnets attached to the interior of the sphere. 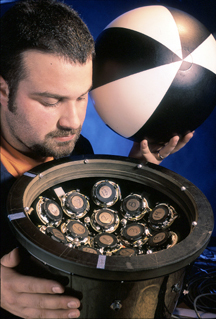 Image F. These electromagnets, activated by a computer, attract the permanent magnets and cause the sphere to move into a new position. Return to news release: "Spherical Motor Allows Ball-Based 3-D Movement".